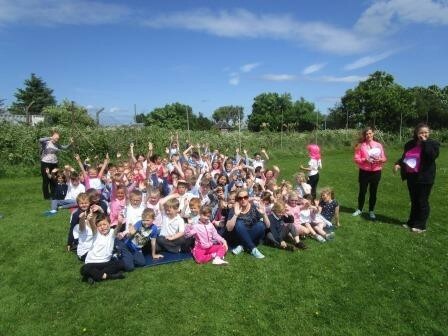 On Thursday 23rd June 2016 Bowmore Primary School held a sponsored Race for Life event to raise money for Cancer Research UK. As well as the race, there was face painting, nail painting, ice lollies for sale and we dressed up in pink & blue. Each class set off running their laps around the football pitch. P1/2 did at least one lap, P3/4 did three laps and P5-7 did five laps. But everyone did more laps than they were asked! 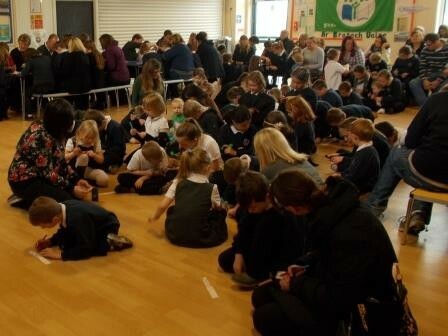 We held our very first Spring Fayre at Bowmore Primary on Wednesday 30th March. The sky was blue, the sun was shining and there was an air of excitement within the school! 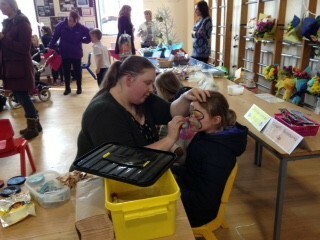 Beautiful crafts were created by our children, from cute wee birdhouses to Easter egg flowers! Our ECO committee sold their home-grown plants and organised a second hand book and toy stall which proved very popular. 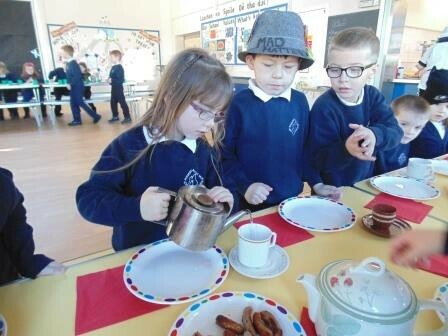 On Tuesday 15th March, Bowmore Primary opened its doors at 8.30am, ready to fill any tummies which needed extra fuel for the day – staff and pupils alike! 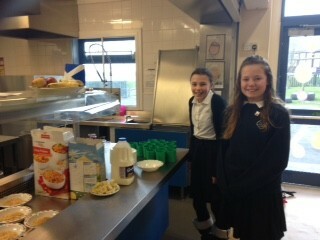 Cereal, including porridge, as well as toast was on offer. Jam and honey added a bit of sweetness to the proceedings and all was washed down with a glass of milk! 30 children tucked in on Tuesday…. Heavenly Bowmore Choir Hosts Lunch! On Monday 7th March, 22 very excited children took the bus up to our Gaelic College to be part of the opening celebrations of Bowmore’s Lunch Club. 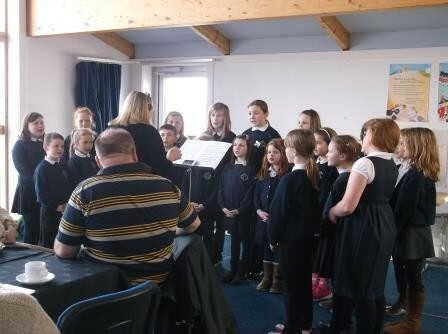 This new club has been set up by Gill Chasemore who invited our choir to sing as part of the ceremony. They sang a toe-tapping selection, including their Mod winning entry Puirt à Beul! All club members enjoyed the performance as well as all the other visitors at the college. The choir and their conductor, Alison Gray, enjoyed not one but two rounds of applause – and they deserved it! 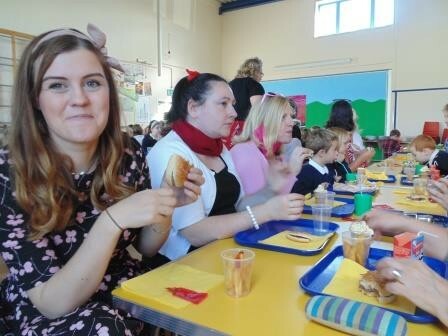 Today, we had a marvellous Mad Hatter’s Tea Party at lunch time! Some of us dressed up as characters from ‘Alice in Wonderland’ and others had some crazy hats on their heads! We were certainly a colourful school. Tweedle Dum and Tweedle Dee (our kitchen ladies) had proper teapots filled with juice and real cups and saucers for us! We enjoyed being ‘mum’ and pouring out juice for our friends. Our Round Church in Bowmore was buzzing on the evening of the 21st of December. Not only downstairs was full, but the upper seats were being taken as well! Our Nativity and Carols by Candlelight Service was being presented there this year. It seemed extra special and very fitting to hold our nativity in the Round Church. It was lovely to be greeted by our school flautists – they had very nicely set the tone for the evening and again played as we left after the service along with other members of the Primary Wind Band. This term our class practised singing Christmas songs and made a Christmas Choir. We sang lots of different songs. 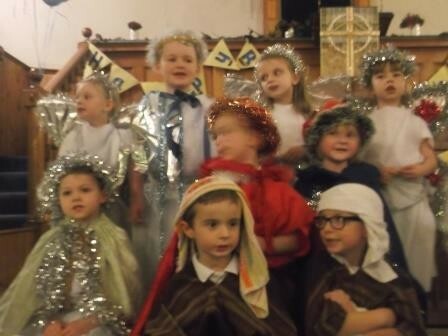 The songs were All Around the World, Away in a Manger, The Animals in the Stable, Jingle Bells, Christmas Dinner and Merry Christmas Everyone. 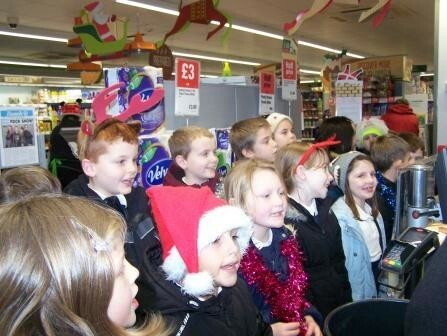 We went down to the brilliant Co-op to sing our songs to the happy shoppers. 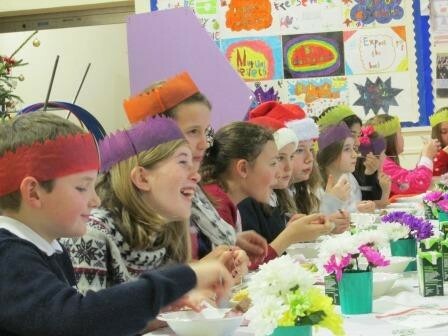 After such a busy term, it was so lovely to sit down altogether and enjoy a spectacular Christmas feast! Our staff waited upon our children – this seemed liked a good move until Ms Gilbert caught Mrs Morris and Mrs Heads swiping the odd pig-in-blanket! Luckily there were enough for all. Our hardworking kitchen ladies provided a scrummy dinner – the full works! Crackers were pulled, jokes were exchanged and tummies were filled all to the sound of Slade and Wizzard – what could be better! Merry Christmas everyone! 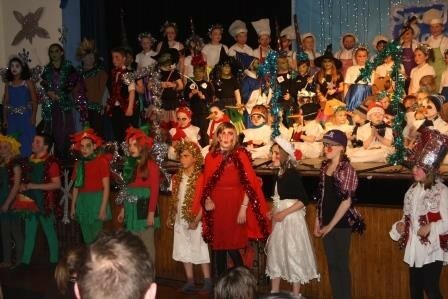 Bowmore Primary School put on its annual glitzy pantomime last Thursday – it was superb! The children performed a new pantomime – The Snowflake Factory! It was the usual mixture of goodies and baddies, fighting over control of the fairy snowdust. We had the cutest P1/2 snowflakes and snowmen, we had P3 wicked witches, wizards and animals, we had P4/5 sparkly fairies and busy bakers. 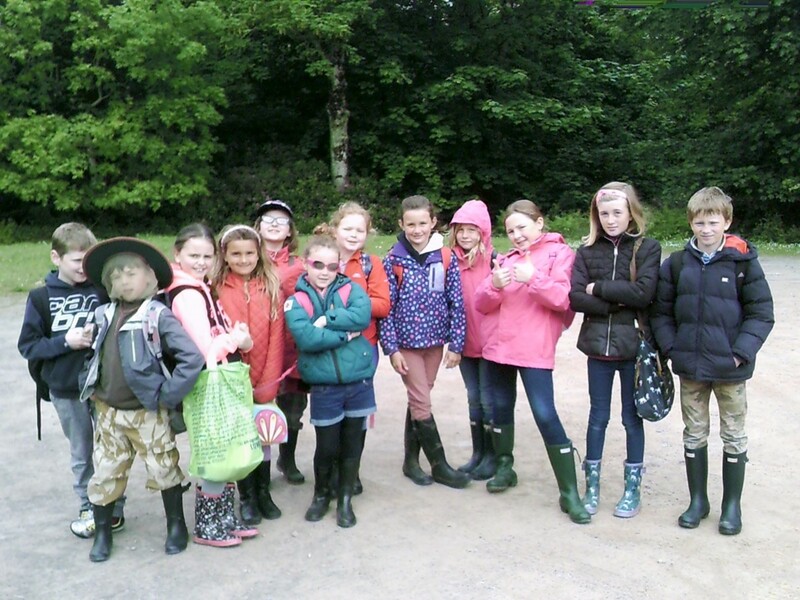 The P6/7 class took over the rest of the supporting cast and the main roles. 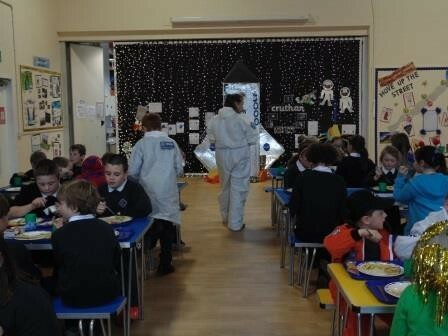 We have been studying space at Bowmore Primary and following Tim Peake! G4-7 used their 3D shape knowledge and built a rocket! P1/2 have made rocket packs to help boost them into space. P3/4 found Tim Peake’s space boots in their classroom along with moon dust footprints. 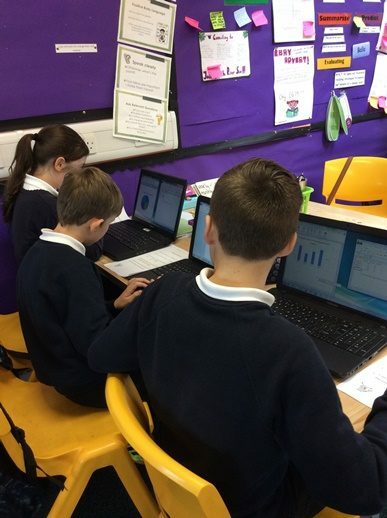 P4/5 seem to spend a lot of time researching in their space station as do G1-3. P6/7 used an awful lot of paper to demonstrate the distance between the sun and the planets and the sun. Once again our wonderful Kitchen Ladies put on a spectacular themed lunch for us – our hall and kitchen were transformed into an American diner. Cadillacs, jukeboxes as well as records adorned our walls as we sat down to enjoy our meal together. On the menu, there were burgers, hotdogs, cream sodas as well as some amazing ‘ice-cream’ cones which were made out of cones and butter icing – no melted ice-cream for us! 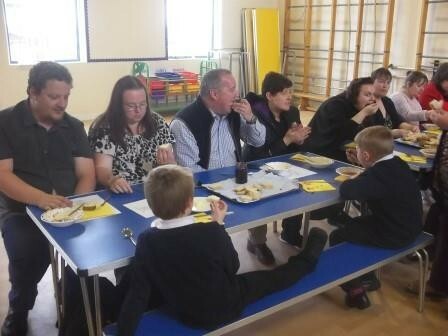 The children of Primary 3 at Bowmore Primary School along with their parents, grandparents, aunties and uncles have just enjoyed a very tasty Harvest Lunch. Tha a’ chlann ann an Clas 3 aig Bun-sgoil Bhogha Mòr agus am pàrantan, seann-phàrantan is eile air Biadh Buain a ghabhail còmhla. 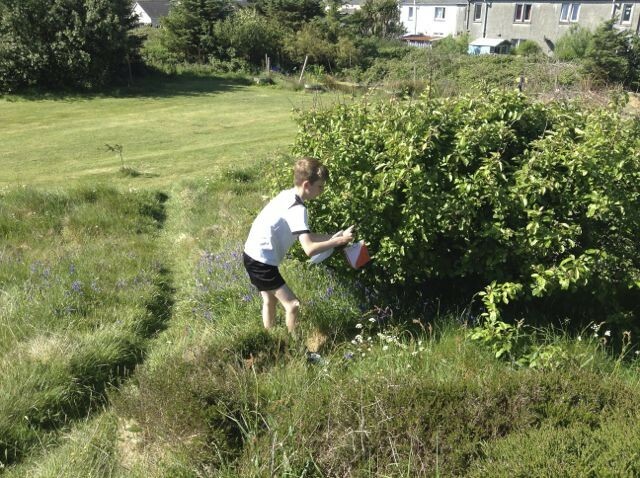 Diluain 16 An t-Ògmhios, chaidh a’ chlann ann an Clas 4-6 aig Bun-sgoil Bhogha Mòr dhan choille aig Beul an Atha. An toiseach, chaidh sinn dhan Ghàrradh Choimhearsnachd airson beagan measan is glasraich fhaighinn. Gu mi-fhortanach, air sgàth an droch aimsir, cha robh mòran ri fhaighinn ach fhuair sinn leiteis, chives, radish agus beagan rùbarab. 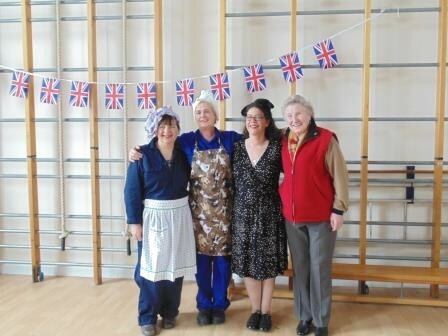 Thanks to our wonderful kitchen ladies, Bowmore Primary enjoyed a lovely lunch which was reminiscent of the street parties, held in celebration of the Victory in Europe in 1945. This celebration was the brainchild of Mrs McHarrie, our kitchen lady! We had cheese, ham, egg and tinned salmon sandwiches, scones and pancakes, all washed down with lots of juice. We had to bring our own cup and plate as everyone did in 1945. 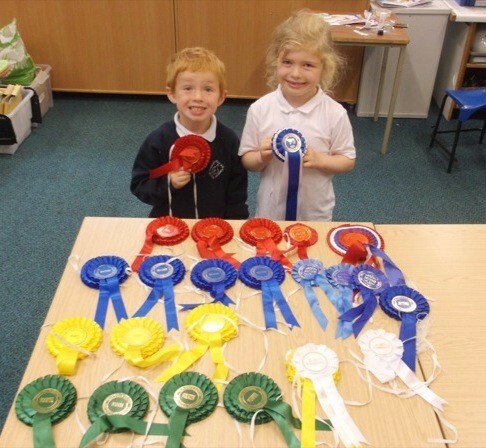 Bowmore Primary have done it again! 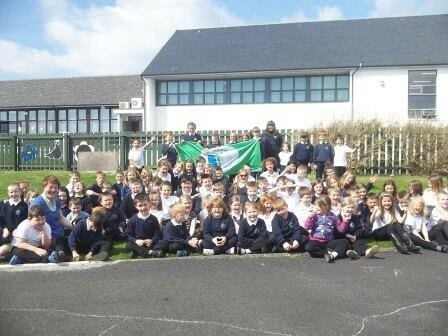 By hard work and dedication, we have earned our fourth Green Flag as an eco-school! Not only do we maintain our eco way of life by litter-picking, saving energy, composting peelings and running a healthy tuck, we have made time to improve our school grounds. Our raised beds and rockery are now well established and used to their full potential. There was a very relaxed feeling about Bowmore Primary today as children and staff supported Comic Relief by dressing down and wearing funny faces! There were quite a few red noses going about and for once, it wasn’t down to the cold! Onsies, princess dresses, pyjamas and hoodies were part of our special ‘uniform’ today as well as some crazily painted faces. We managed to raise lots of smiles as well as £234.00! A huge thank you goes out to our parents and friends for supporting Comic Relief through our school. Well done Bowmore!